A beautiful series of interwoven stories about the nature of humanity in transition. Peek inside the minds of people standing on the precipice of what could be the apocalypse. It could be scary, it could be loud, but it could just as easily be a whisper. Will the earth shift, or will we just quietly close our eyes and pass from one world to the next? Tickets can only be reserved at the door, the day of the event, beginning at 6:30pm. Subject to availibility. Limit 2 tickets per order. Explore the play’s sense of time and its relationship to the stories we tell with a literary expert, a physicist, and artists from the production. SEE THIS PERFORMANCE. Sunday, June 22nd- Bulgarians on Bulgaria: a Skype session. 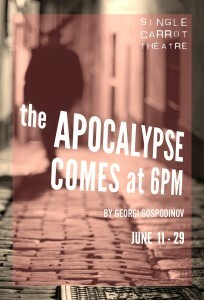 Join us after the show as we chat with Bulgarian Artist Vasilena Radeva, former SCT Artistic Director Nathan Cooper, and The Apocalypse’s director Genevieve de Mahy about Bulgaria’s past and present as it relates to The Apocalypse Comes at 6pm. There will be a wine and cheese reception directly following the performance and preceding the Skype Session.” SEE THIS PERFORMANCE. The cast and creative team will stick around to chat with you about the making of The Apocalypse. SEE THIS PERFORMANCE. We have a limited number of $10 “RUSH TICKETS” available for each performance. These tickets can only be purchased in person, at the door, the day of the performance you would like to see. Is there an extra fee associated with ordering a ticket? Yes. Parking is available in the lot just west of our theatre on 26th street and in the lot at the southeast corner of 26th and Howard Streets. There is also street parking available. I am 21 or over. If I bring my valid ID, can I get a free drink at the show? I am not yet 21 or I do not drink alcohol. Did you forget about me? Nope. We also offer a complimentary soft drink or water. Where should I eat before the show? We recommend visiting any of the fine establishments highlighted on our YOUR VISIT page. Just be sure to allow extra time, since our seating is general admission. Is your seating general admission?